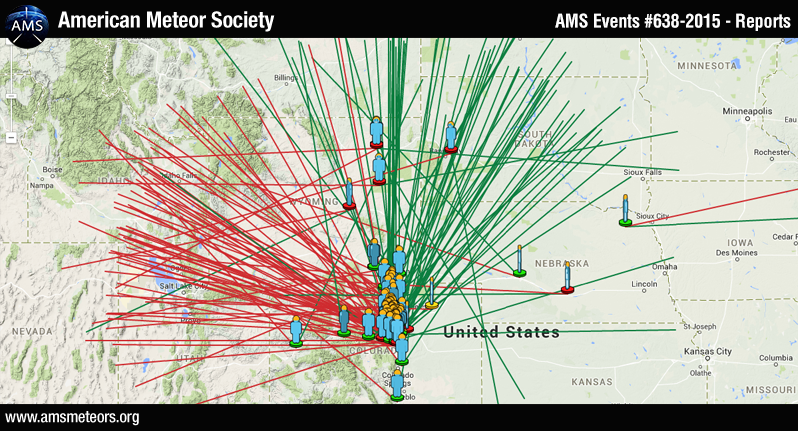 The AMS received nearly 150 reports this morning of a bright fiery object traveling from the east to the west over southern Wyoming and northern Colorado. Many of the witnesses reported a slow moving object with a long duration spanning 20 seconds. 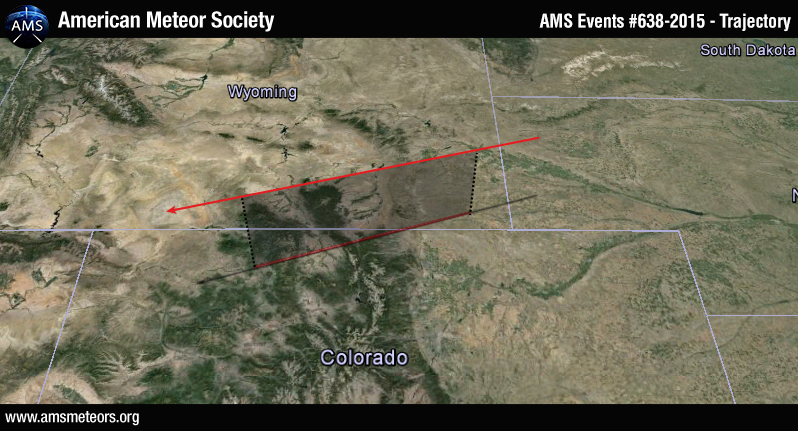 This is an atypical meteor event because most fireball meteors last only 3-5 seconds. Slower moving, longer lasting fireballs are generally associated with satellites or other types of man-made space debris re-entering the atmosphere. However, there are exceptions and Earth grazing fireballs can appear to move slower and be visible for longer periods of time. The estimated 3D trajectory computed from the witness reports shows an extremely shallow entry angle, one that could be associated with an Earth grazing fireball. Additionally the re-entry of space debris tends to span a longer distance. 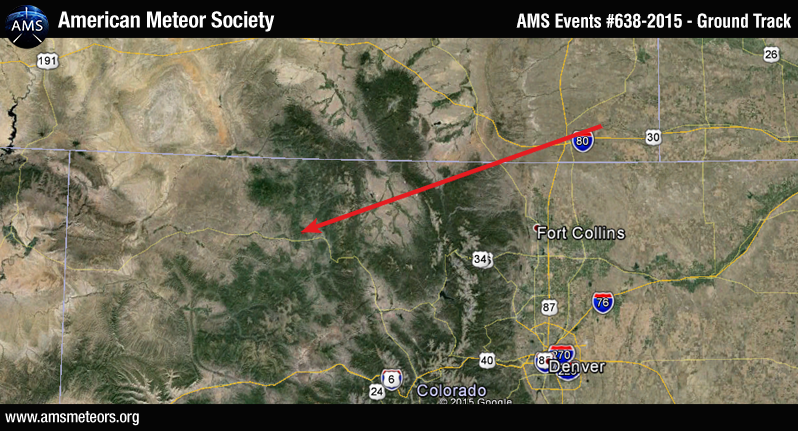 Two space debris reentry events over Colorado last year covered over a 1,000 mile ground track, where as the event this morning appears to have only span a distance of 150 miles. We are investigating further, but as of now it is not certain if this event was a fireball meteor or space trash. If you witnessed this event, please fill out an official fireball report. Chris Peterson of Cloudbait Observatory operates an all sky camera network in Colorado and caught the fireball on one of his cameras. Space junk can’t be excluded, but I agree it appears more like a natural meteor. I might estimate the ground path at about 300 miles, but that’s just an educated guess using the single camera. If so, that places the velocity in the 30-40 km/s range, which is very typical for a meteor, but excludes a reentry. It’s not exceptionally bright, so I’d suggest it was at high altitude and had only a very shallow descent angle. I observed this event a little after 6am this morning. It appeared brighter and larger than any star or planet, but not as large or bright as a full moon. The head was white and it was trailing a fiery red trail. This object was moving from east to west. Your maps indicate that it was moving from west to east. I seen the bright fireball while I was heading North on I-25 at Arapahoe Road. I see myself as a novice astronomer as we view both the perseids and geminids meteor showers every year and own a dobsonian telescope for viewing constellations. This was far to bright to be just a meteor falling and it did not leave a trail like a meteor typically does. I was walking on Nimbus Road north of Boulder headed east and saw the object to my right, or north. I checked my watch — 6 a.m. It was bright, I believe I saw heat or ignition and it definitely was traveling east to west. It moved slowly compared to the very few other meteorites I’ve seen, appearing to be at a low altitude and was at a shallow angle of descent. It disappeared over the foothills and I honestly expected, because of the apparent low altitude and angle, to see an impact flash northwest of my position. Me and my wife were traveling on County Rd. 14 towards Hwy. 131 at 6 am when we saw a huge object with very little fire surrounding the object. It was moving very slow at almost parallel to the ground almost to the top of the hills. It was odd shaped with red and blue flames. It didn’t have a normal tail flame to it. It had a small red tail at the top and bottom. It was moving from Steamboat to Oak creek. I thought it was a helicopter with a landing light at 1st because it was moving so slow and was very bright. I then saw the fire trailing behind it. It moved from East to West and disappeared over the Flatirons. I watched it for 10-15 seconds. I read the article the next day in the Daily Camera. It’s nice to know what I saw. We live 10 miles north of the New Mexico border on the Animas River in SW Colorado. At 6:35 am this morning I saw a large bright object (a fireball?) traveling west. 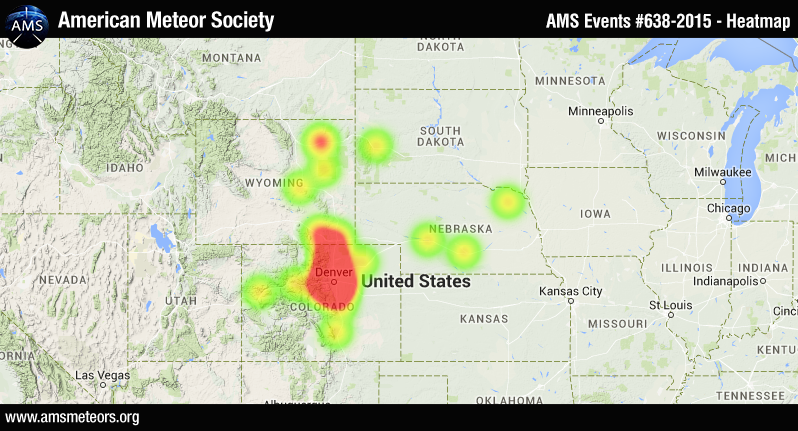 It does not appear to be the northern CO event reported but may be part of the same cluster. I’d be interested in knowing if this was reported by others. I used to use a Smithsonian Institution “fireball hotline” and wonder if there still is such a convenient way to report these phenomena? There seems to be about 8 reports that match your time. These are all from Arizona but it still could easily be the same object. As for a Smithsonian Institution “fireball hotline”, I have not heard about this and whether it is still active. Our suggestion would be to fill out a fireball report on the AMS website as these sightings have been used by NASA and meteorite enthusiasts to help gather information. of the fireball you seen look like ? The fireball witnessed in Colorado sounds very similar to one I witnessed from a moving vehicle in Boston on May 2nd, 2015. It was low-flying, appeared brighter than a star or planet but not quite as bright as large as a full moon. It’s “tail” was very short and its bright, burning center went out after a couple of seconds. It was reported on AMS Meteor Society as event 1037-2015. Is anyone here from New England and saw the event on May 2nd?